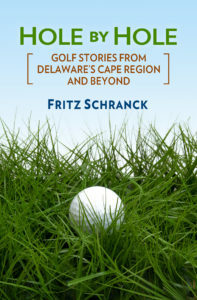 The Cape Henlopen High School golf team started its 2005 season in familiar fashion. Andrew Parsell brought a strong sense of traditional style to his first high school golf match. 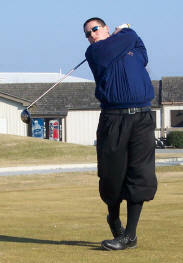 The Cape Henlopen player wore a classic pair of black golf knickers. In a blistering cold wind at Rehoboth Beach Country Club, the Vikings lost to the Caesar Rodney Riders, 166-174. Andrew Schneider also shot 44, but he was a bit more upbeat about it. “My main problem was putting. My chipping saved me a lot of times, with some one-footers that helped. I hit every shot solid.” Schneider parred the 4th and 7th holes, and doubled the first hole. It wasn’t all bad. Hatter’s approach shot on the par-5 fourth hole was superb. His second shot landed on a small strip of aerated turf between a pond and the cart path, about pin high but 50 yards left of the green. From his perspective, another pond lay beyond the green on the other side. His wedge shot stayed low, landed on the green, and checked up quickly to about a dozen feet from the hole. He two-putted for par. Travis Parker seemed a bit nervous and a lot cold. He started off well, with pars on the 2nd, 3rd, and 5th holes, but quadruple bogeys on the 6th and 8th holes helped balloon his score to 50. “That was horrible,” he said. Andrew Parsell was the sixth Viking, and he admitted to having some serious tree trouble. “I was a regular Paul Bunyan, Jr. out there,” he said. The Vikings are off for spring break next week. Their next match won’t be held until the week of April 3. Pete Oakley returned to the Cape Region this week from his Champions Tour adventures, and he was a happy guy. “I am so glad to be home. I am ready for a break,” he said. Oakley played seven straight tournaments, six on the Tour and the season-opening European Senior Tour event in Barbados. The Champions Tour has no tournaments scheduled until the week of April 18, but the time off came at a good time for The Rookery’s Director of Golf. He shot 6-over par at the Toshiba Senior Classic, held March 18-20 at Newport Beach Country Club in California, in a tie for 71st place, and earning $1,303.50 in official money for the week. After a one-over par 72 in the opening round, Oakley bogeyed his first hole in the second round. He then butchered the second hole for a triple bogey, making him 4-over for the day. He steadied himself and finished with a 76, and then played his third round with an even-par 71. “I felt encouraged by that last day,” Oakley said. His next tournament is in Savannah, Georgia at the Liberty Mutual Legends of Golf tournament, with the first round held on April 22.